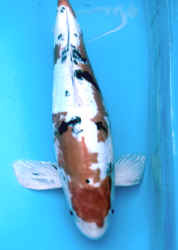 Butterfly Koi: A long finned making of all the other varieties of koi. The name "Butterfly" is appended to the front of the Japanese designation. Enlarged pectoral fins of a Butterfly Doitsu Taisho Sanke koi.